A sociologist by training, she is a graduate of the Graduate School of Social Research at the PAN Institute of Philosophy as well as the University of Warsaw’s Institute of Applied Social Sciences (ISNS). VShe is currently a lecturer at the Collegium Civitas Department of Sociology with a doctorate on the subjective actions of individuals. 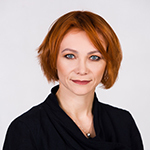 Having lectured at the Warsaw University of Technolog’s Department of Environmental Engineering from 2003 to 2013, she has, since 2013, become Vice-Rector for Scientific Research at Collegium Civitas. She is the author and/or editor of, among others, the following publications: Budowanie partnerstw lokalnych: Razem dla Regionu! (Building Local Partnerships: Together for the Region, 2009); Konsultacje społeczne wokół inwestycji infrastrukturalnych (Public Consultations regarding Infrastructure Investments, 2010); Profesjonalny menedżer w NGO (The Professional Manager in an NGO, 2011, 2012); and Być i działać w społeczeństwie: dyskusje wokół teorii podmiotowego sprawstwa (To Be and to Act in Society: the Debate over Theory of Subjective Agency, 2015). She is interested in problems of mobilization of civil society, the activities of NGOs in Poland, research in local communities and sociological aspects of environmental protection. In her free time she practises yoga and is involved in social projects.